A manifestation of New Orleans’ love of celebration through food (and drink), Jack Rose is the newest concept from QED Hospitality in New Orleans’ historic Pontchartrain Hotel. The culinary crown of the hotel, alongside Hot Tin, Bayou Bar and the Silver Whistle Cafe, Jack Rose brings an eclectic and fun dining experience to the Garden District. 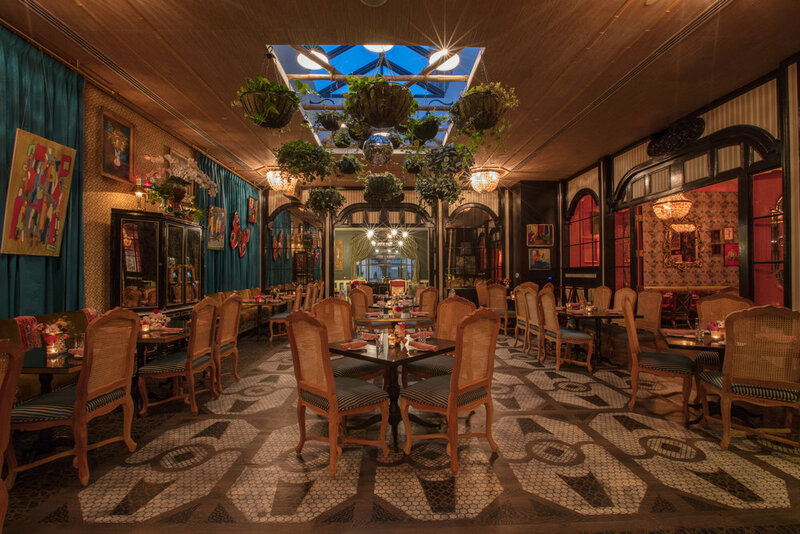 The lively atmosphere encourages spontaneous celebration whether enjoying dinner in the Jack or Rose rooms, hosting an escapade in the Mile High Pie Club, snacking on small plates under the Lil Wayne Portrait in the Living Room or sipping sparkling rosé in the Rose Garden Patio. In keeping with the building’s homage to the Pontchartrain’s connection with Tennessee Williams, the name is inspired by his play The Rose Tattoo. Jack Rose features menu items that are a mix of New Orleans’ craveable Italian, French and Spanish dishes. The cuisine is unpretentious and skillfully executed. Guests can expect the Crescent City’s joie de vivre atmosphere, coupled with tableside preparations inspired by classic dishes alongside modern delicacies that are complemented by vibrant cocktails and a wine list that skews towards bubbles. Jack Rose is four distinct rooms, each designed with a different personality and unique experience in mind: two main dining rooms, the Mile High Pie Club and the Living Room. 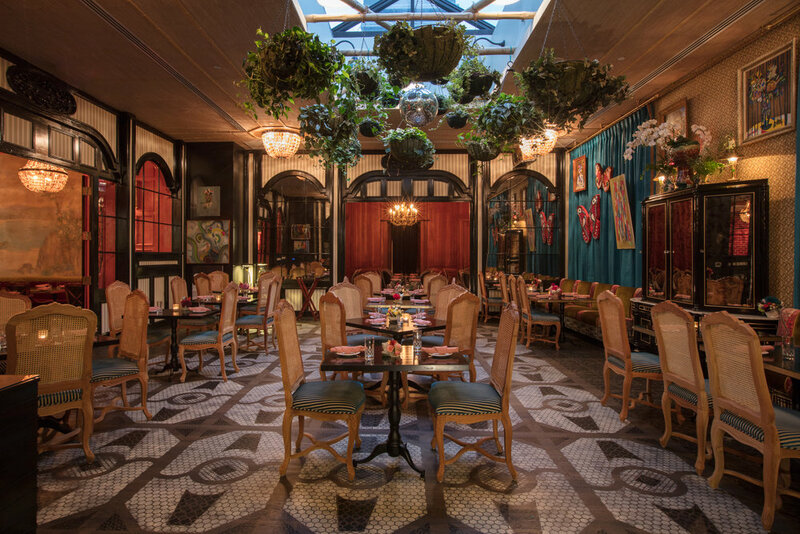 A bold mix of old and new, the exuberant dining room features not only floral tablecloths but also Moroccan-inspired painted wood floors. Designer Andrew Alford tapped local abstract artist, Gavin Jones, to paint a selection of tabletops, creating the opportunity for diners to have a meal over a piece of art. 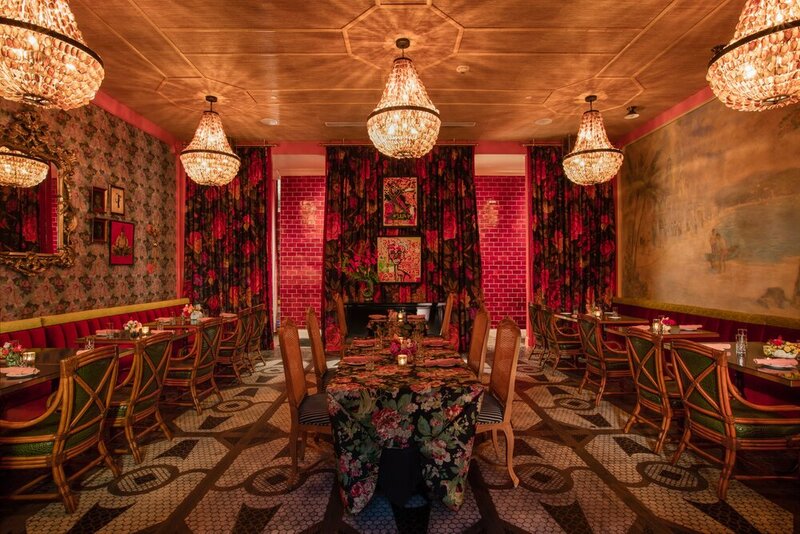 Adorning the space is a dramatic teal blue drapery, cut glass tables and four different wallpapers, one of which is a gorgeous floral print grass cloth from Stark chosen because the floral motifs and soft color palette perfectly complement the original Charles Reinike mural. The infamous Ashley Longshore portrait of rapper Lil Wayne remains in its place of honor in the Living Room.